Shape and velocity of the striking object are the main factors that determine the type of maxillofacial injury (ie, soft tissue alone vs bony). Mandibular fractures usually occur in 2 or more locations because of the bone's U shape and articulations at the temporomandibular joints. Fractures also may occur at a site apart from the site of direct trauma. A large percentage of mandibular fractures are open, as they often fracture between teeth and communicate with the oral cavity. Different mechanisms are associated with varying locations. Fractures from automobile crashes most frequently occur at the condyle and symphysis, those from motorcycle accidents at the symphysis and alveolus, and those from altercations mostly at the condyles, angles, and body. Fractures of the mandible can be stable (favorable) or unstable (unfavorable) depending on how the fracture line courses in the bone. Muscles attached to the mandible continue to exert their forces. 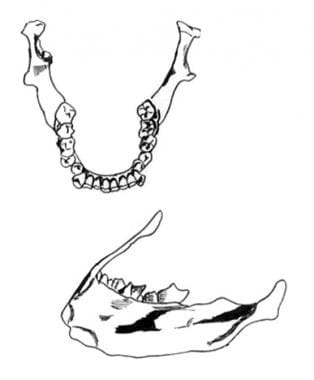 Elevators of the mandible are the masseter, temporalis, and medial pterygoid, while depressors and retractors are the mylohyoid, geniohyoid, and anterior belly of the digastric. Lateral pterygoid is the protrusor of the mandible. Direction of fracture determines whether it is stable or unstable. Fractures running from posterior downward to anterior (favorable) generally are stable, because muscles pull the fragments together and can be treated with soft diet and arch wires if fragments are not aligned. One study placed the incidence of severe maxillofacial injury (fractures, lacerations) at 0.04-0.09% for motor vehicle crashes. Incidence of fractures due to motor vehicle injuries is higher in rural areas; altercation-related injuries are more frequent in inner cities. Incidence of other major injuries is as high as 50% in high-impact mandibular fractures, whereas it is 21% in low-impact fractures. Mortality rate in high-impact fractures is as high as 12%, yet death rarely results directly from maxillofacial injury. Patients who are involved in motor vehicle crashes are more likely to have additional injuries than patients with violence-related injuries. The incidence of associated cervical spine injuries ranges from 0.2-6%. Adult male-to-female ratio is 3:1. Suspect domestic violence or sexual assault in women as this may coexist in 30% of cases. Male predominance is reduced to 3:2 in children. In nonmotor vehicle injury, the possibility of child abuse should be a concern. Instruct patient on how to release Erich arch wire if he or she has problems with airway. For patient education resources, see the Breaks, Fractures, and Dislocations Center and Teeth and Mouth Center, as well as Broken Jaw.